The village of Sanogoan, at the edge of Kathmandu Valley, was one of the many villages devastated by the earthquake that struck Nepal last April. In the aftermath of the earthquake the town turned into a tented camp, after so many houses were destroyed. While home reconstruction in Nepal has been delayed, 90 families from the village have recently received the funds needed to rebuild their homes. Presbyterian World Service & Development, through the ACT Alliance and Lutheran World Federation, is supporting these efforts. The village has come together to build these first 90 homes. The tight-knit community is making bricks together and taking turns rebuilding. The first bricks will go to the most vulnerable family—whose home will then act as a model house. 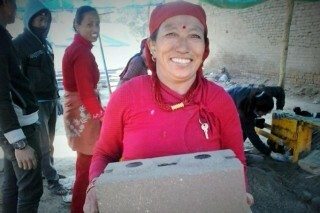 Kabita Shrestha is one of the brickmakers. While she may look like she doesn’t have a care, Kabita’s life has been difficult. After losing her mother at a young age, she didn’t have the chance to go to school or start a family. Instead she took care of her father and brother. Kabita was injured during the earthquake and lost everything when her home collapsed. In the wake of the earthquake, Kabita struggled even more to meet her family’s needs. But nine months after the earthquake she’s starting to feel some relief. Kabita’s family was one of the first selected to receive funds to rebuild their home—and it has taken an enormous weight off her shoulders. If all goes well, Kabita will hopefully be moving into her dream home before the end the year. *Adapted from a story by Lucia de Vries on the Lutheran World Federation website.